Time to sell your Jubilee Landing condo? Read about today's resort-market buyer. 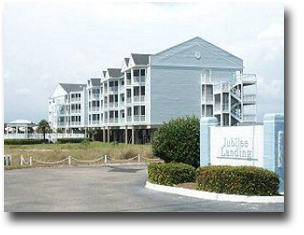 Jubilee Landing condominium is located approximately 1.5 miles East of Perdido Pass. This area of Orange Beach is a very narrow strip of land allowing for great views of the gulf and Old River, as well as Terry Cove and Robinson Island. The floor plans for Jubilee Landing are: one bedroom condos are approximately 600 square feet, two bedroom condos are around 1,000 square feet and the three bedroom units are just over 1,100 square feet. Jubilee Landing is a smaller condo with only 33 individual units and the amenities include an outdoor water front pool, BBQ area, fishing pier, gazebo, covered entry, pets are allowed and the best amenity is condos boat facilities. Jubilee Landing has covered, assigned boat slips with power, trailer storage and water available. The slips at Jubilee Landing are less than 1.5 miles from the Perdido Pass bridge and entrance to the Gulf of Mexico. Please let us know if you would like further info for Jubilee Landing or any other condo, home or real estate in the area or would like to schedule a private viewing by emailing info@condoinvestment.com or by calling (251) Area-Pro (251-273-2776) for immediate assistance. Learn how to increase your Jubilee Landing rental revenue by reading our RENTAL TIPS. Find revenue numbers for Jubilee Landing and all Orange Beach condos using our Alabama Gulf Coast Condo Revenues page.